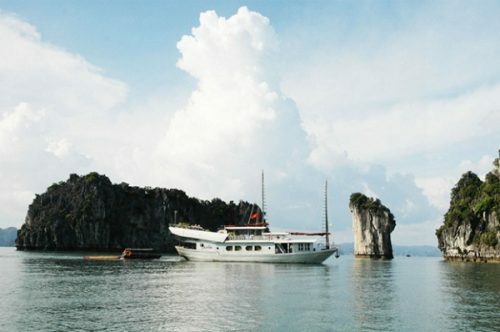 Ha Long has two distinct seasons, you should go into the period from April to June, when the weather is cool, not too hot. It facilitates some outdoor activities such as bathing and sightseeing. Do not go to Halong in September because there are usually storms or cyclones during this time and winter will be more fog and cold. 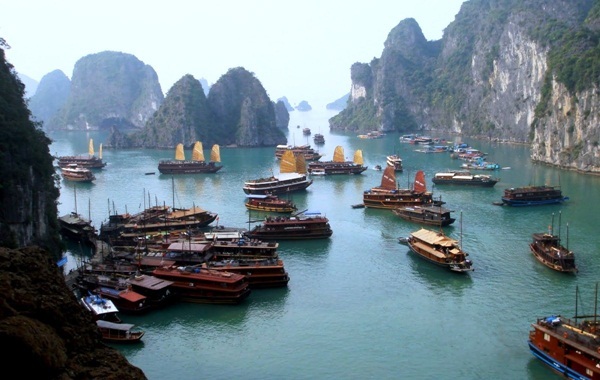 Trains from Hanoi to Ha Long: You can choose the tourist train departs from Gia Lam station, which takes about 5 hours to Halong and the ticket price is about 100.000VND / way / person. Cars: The cars to Halong often concentrate at the My Dinh and Luong Yen station in Hanoi. Buses space approximately 5-15 minutes. Route 1: From Hanoi, you can go along no.5 street to come to Bac Ninh then follow No.18 street through Pha Lai – Chi Linh – Dong Trieu – Uong Bi – Halong. The total route is of about 155km. Route 2: Noi Bai Airport – Bac Ninh – Highway 18A through Pha Lai – Sao Do – Dong Trieu – Uong Bi – Halong which is about 160 km. 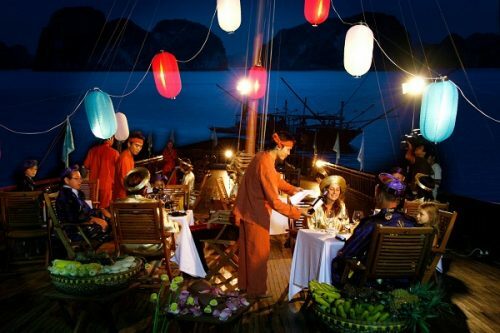 In Ha Long, there have several restaurants ranging from budget to premium basing on which options you choose. Being a coastal area, Halong is famous for seafood dishes including: Cu Ky, Be Be, Sa Sung, steamed oyster, baked oyster which are very nutritious and delicious. Specifically, it would be a mistake if we do not mention fried squid, a speciality of Halong which you can buy at any local market. Also, you should enjoy fried with squid sticky rice, sea crab, nem chua or rice wine. Overall, shopping at Halong is very comfortable since its price level is fairly affordable. 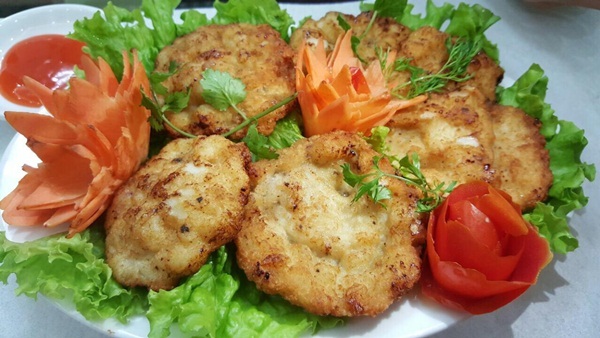 Most tourists often buy Halong seafood as a gift for their friends and relatives. When you buy something fresh, you should pay careful attention to the preservation. 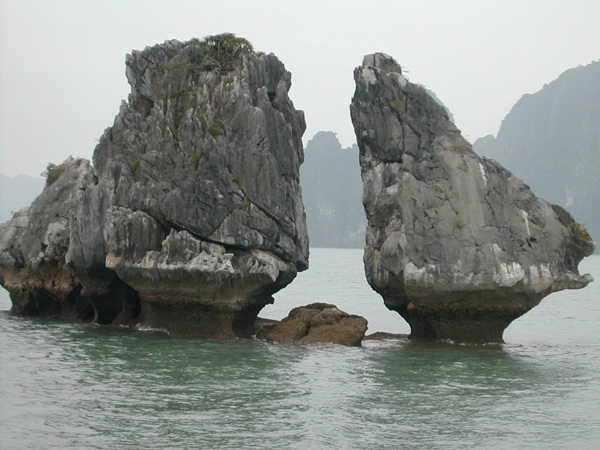 This is one of the most interesting travel experiences in Halong. Here in Halong, there are many beautiful islands, especially the islands with different shapes like the hovering dragon – Hon Rong; two chickens are playing with each other on the waves – Hon Trong Mai; an old man is fishing – Hon La Vong. Bai Chay resort situated along Halong Bay is suitable for bathing and rest. Co To Island with beautiful coral reefs still retains the wild character and peace. Being the center of the World Heritage Ha Long Bay, Sung Sot Cave, which is located on Bo Hon Island, are stalactites with rich variety of shapes. 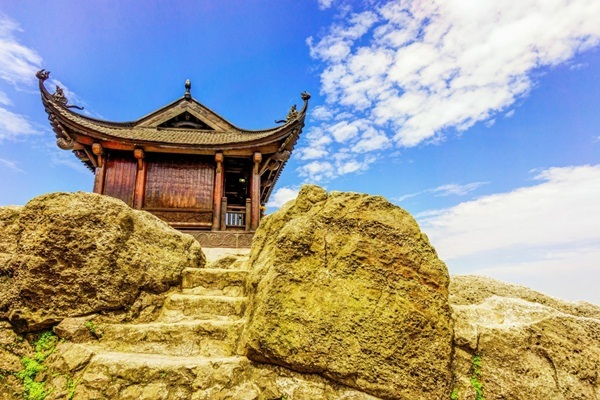 If you would like to go to church the you should visit Yen Tu Pagoda, where the system of pagodas and towers blend with the natural surroundings to create a pure and tranquil scenery of a bustling Halong. Be careful to check the quality and quantity of goods that you bought. If you want to have an overnight on boat then you should not bring any food or drinks because you will be subject to a service fee which is very expensive. Do not leave litter at tourist destinations. 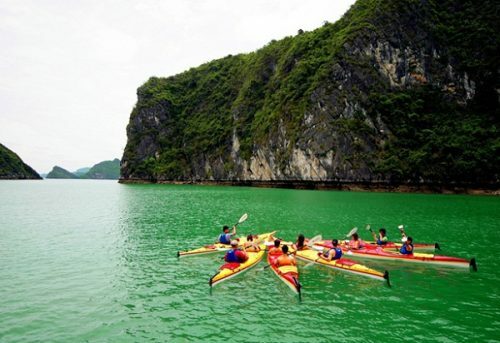 The compliance with the provisions of Halong tourist destination along with the travel experience will surely give you a safe – and – fun trip and it promises many surprises.